From Sonora to Sonoma, from the Badlands of the Dakotas to the California Baja, the courage and determination of American Indian women was astounding. Day in and day out they faced death and deprivation from an unforgiving environment and a multitude of predatory enemies. 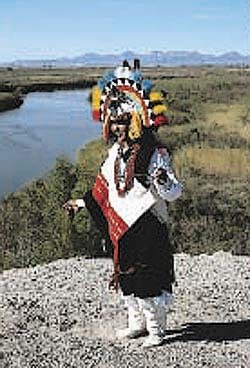 Take the experience of an Apache tribeswoman named Dilchthe. Among her Warm Springs clan, she was not a storied woman warrior. In fact, she was a middle-aged grandmother when she was captured by Sonoran mercenaries at Esqueda, Mexico (south of present-day Douglas, Ariz.), in the mid-1860s. The Apache men in her party were quickly executed. Dilchthe and several other women were driven southwest to the Gulf of California. There, the captives were sold into slavery and shipped across the gulf to a penal colony on the Baja Peninsula. Many of the Apache captives died in the camp, but Dilchthe hung on tenaciously. Not long after their arrival, she and several others were sold again and began working on a nearby hacienda. In spite of her age, Dilchthe was a good worker and soon earned the trust of her owners. They treated her fairly and gave her additional responsibilities, but she had other plans. She hid food and planned a break for freedom. Dilchthe was determined to somehow, some way, make it back to her family. Although the women conserved their supplies as best they could, eventually their provisions ran out. Sleeping by day and traveling by night, they pressed on. Eating insects and a variety of desert plants, they kept trudging north for nearly 300 miles. Nearing the mouth of the gulf, they approached their biggest obstacle--the mighty Colorado River. How could they safely cross it when none of them could swim? Dilchthe stubbornly insisted they would find a way. She sought out and befriended a kindly old Mexican who told them where they could safely ford the wide river. Once again the women pushed northward along the west bank of the Colorado until they reached the confluence of the Gila River and the Colorado (later the site of the Yuma Territorial Prison). Finding the exact spot the old Mexican had described to her, Dilchthe carefully waded into the cold current. Just when it looked as if she was about to be swept away, Dilchthe stepped up onto a sandbar and quickly crossed to the other side. Her charges then followed her across. They all safely made their way through the thick underbrush, eastward along the banks of the Gila and into Arizona Territory. They were about halfway home. Outside the Yuma Valley, the women confronted barren terrain and soon were suffering from the heat. A few of them wanted to leave the lowlands and climb into the cooler mountains to the north, but Dilchthe knew those mountains were home to their enemies, and she urged them to stay on the Gila because it would eventually lead them home. On the third night after crossing the Colorado, they were attacked by Yuma (or Mojave) raiders. One woman was captured, and all but two of the others were killed in the ambush--Dilchthe and another woman fled into the brush. Once again they were hunted, but Dilchthe was too wily for the pursuers. The two Apache women walked four more days over the dreary, hot, mostly dry riverbottom, past the Gila Bend, past Maricopa Wells (near present-day Phoenix), and around the Pima and Papago camps and villages (virtually all the tribes in this area were enemies of the Apache). Dilchthe and her companion made it another 100 miles before collapsing northeast of present-day Safford, Ariz. Almost crazed from grief and hunger and too weak to walk another mile, Dilchthe made a signal fire. Incredibly, her own son-in-law came into view. After what she had been through, she must have thought it was an apparition, but it was not. Dilchthe and her friend had been saved. Normally, it is strictly taboo for an Apache woman to look her son-in-law in the face, but this time the tradition was overlooked as he hugged her and welcomed his brave mother-in-law back from the dead. Dilchthe was reunited with her family and welcomed back into her tribe as a hero. She had walked more than 1,000 miles and outwitted and outmaneuvered all her pursuers. Through it all, she had carried no map, no weapons and almost no provisions. Her undying determination to reach her Warm Springs clan demonstrates a rare kind of courage. She was the Apache grandmother with the iron will--truly a wild woman of the Wild West. .